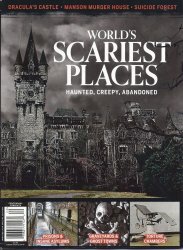 Centennial Media presents America's Scariest Places magazine. A must for those interested in monsters, ghosts, and the paranormal. 100 full-color pages including cover. Collectors Note: These perfect-bound, glossy color magazines are brand-new, never circulated, and picked from a carton received directly from the publisher. However, they are not mint. They have some scuffing on corners and/or spines caused in shipping from the publisher. The sale price reflects the condition. 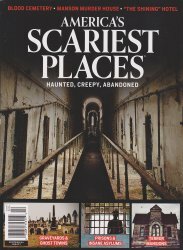 Also want the World's Scariest Places magazine? Use the convenient Buy Both Button below. The following video is not associated with this magazine in any way, but it does give you an idea of some of the scariest places in the U.S., according to the producers of the video, of course.